Contributed photo David Stogner, a Richmond Young Professionals member, plays disc golf on the new course at Hinson Lake. 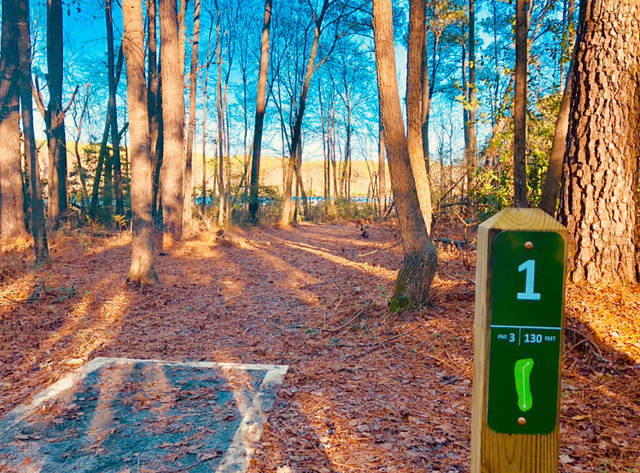 The Richmond Young Professionals will be hosting their inaugural Disc Golf Tournament at the newly constructed course Hinson Lake on Saturday, April 27. 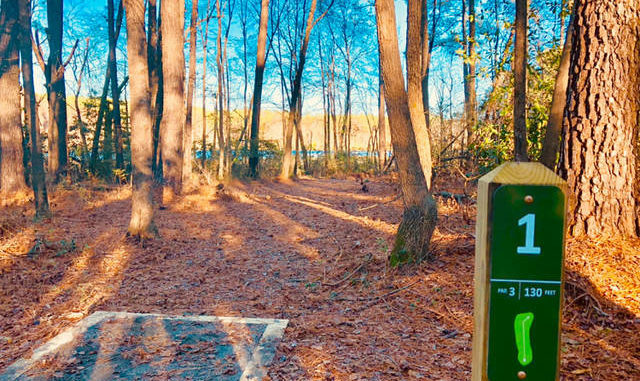 ROCKINGHAM — As part of their effort to bring events to the area that everyone can enjoy, the Richmond Young Professionals will be hosting their inaugural Disc Golf Tournament at Hinson Lake on Saturday, April 27. The organization, an associated branch of the Richmond County Chamber of Commerce, worked together with the City of Rockingham to build the new course — which was completed in November 2018 — and put together the one-day tournament that has received “a really good response” from the community, RYP member David Stogner said. The ages of those expected to compete range from 10-65 years old and the sponsorship opportunities (hole sponsor, top hole sponsor and presenting sponsor) are being seized by local businesses that support the cause. “It was one of our big pushes to really do something outside the group that everybody in the community could participate in and take part in,” Stogner said. “We’ve got a motto of ‘Work. Play. Give.’ and this is part of the play effort. He added that the reason he thinks businesses have jumped aboard is because the course has attracted players from Charlotte and Wilmington. “They are stopping in Rockingham and spending money,” Stogner said. Not only will the inaugural event give tournament goers a good exercise (Stogner says players will walk an average 2.5 miles per round), it will also help RYP raise funds for its “Get Outside Fund”, which promotes an active and involved lifestyle. A portion of the proceeds will be used to improve the course, as the organization plans on adding more benches and trash cans to accommodate players and additional baskets so it would be able to change up the course throughout the year. Stogner said RYP and the City of Rockingham were also looking into building the course on the land that is the 14-mile Hitchcock Creek Blue Trail, but ultimately decided that Hinson Lake was the better of the two Rockingham locations. “We were able to lay out a tournament-level, 18-hold course,” he said. The tournament will be split into two different playing fields: the singles tournament for more competitive players who are going for the top prize and the captain’s choice tournament for those who just want to get out and have fun. There will be a cash prizes, disc golf trophies and “other goodies” for the winners of the singles tournament. Team prizes along with “closest to the hole” and “longest drive” honors will be awarded in the captain’s choice field. For more information on how to register, sign-up and sponsorship benefits, etc., contact Stogner at 910-206-1583, send him an email at [email protected] or visit the “Richmond Young Professionals” page on Facebook. 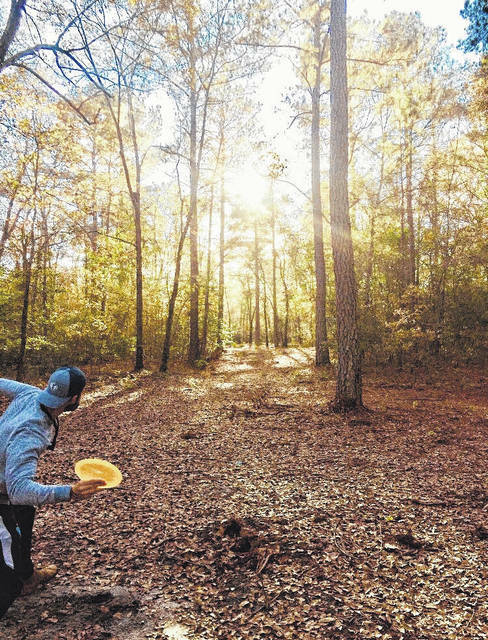 https://www.yourdailyjournal.com/wp-content/uploads/2019/04/web1_disc-golf-2-1.jpgContributed photo David Stogner, a Richmond Young Professionals member, plays disc golf on the new course at Hinson Lake. The Richmond Young Professionals will be hosting their inaugural Disc Golf Tournament at the newly constructed course Hinson Lake on Saturday, April 27. Reach sports editor Leon Hargrove Jr. by phone at 910-817-2673 or by email at [email protected].